Both desiccant-based and refrigeration-based dehumidification systems work most efficiently when used together. The advantages of each compensate for the limitations of the other. Refrigeration-based dehumidification systems are more economical than desiccants at high temperatures and high moisture levels. In general, mechanical refrigeration systems are seldom used for applications below 45% RH. For example, in order to maintain an outlet condition of 40% RH it would be necessary to bring the coil temperature down to 30º F, which results in the formation of ice on the coil and a reduction in moisture removal capacity. Efforts to prevent this (defrost cycles, tandem coils, brine solutions etc.) can be very cumbersome and expensive. Desiccant-based systems are more economical than refrigeration systems at lower temperatures and lower moisture levels. Typically, a desiccant dehumidification system is utilized for applications below 45% RH down to 1% RH. Thus, in many applications, a DX or chilled water pre- cooling coil is mounted directly at the dehumidifier inlet. This design allows for removal of much of the initial heat and moisture prior to entering the dehumidifier where the moisture is reduced even further. The difference in the costs of electrical power and thermal energy (i.e. natural gas or steam) will determine the ideal mix of desiccant to refrigeration-based dehumidification in a given application. If thermal energy is cheap and power costs are high, a desiccant based system will be most economical to remove the bulk of the moisture from the air. If power is inexpensive and thermal energy for reactivation is costly, a refrigeration based system is the most efficient choice. 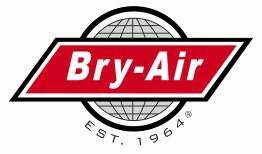 In general, Bry-Air representatives should be looking for applications which require humidity control at levels below 45% RH. Each month we send you an Application Update which discusses various applications which require humidity control below 45% RH. The most common applications requiring this 45% RH level or below are: Pharmaceutical, Food and Candy, Chemical Laboratories. Automotive, Military, and Marine Storage. Most applications requiring 50% RH or higher are probably not worth expending a whole lot of effort on because they can usually be achieved through mechanical refrigeration. In some cases, however, the use of a desiccant system can reduce operating costs of the existing refrigeration system. For example, when treating ventilation air in building HVAC systems, the dehumidification of the fresh air with the desiccant system decreases the installed cost of the cooling system, and eliminates deep coils with high air and liquid-side pressure drops. This saves considerable fan and pump energy as well. 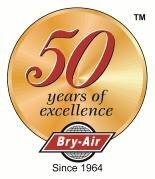 Learn more today – contact us to request more information on Bry-Air solutions for your industrial desiccant dehumidification needs.